I’ve never met an upside-down cake that I didn’t like. 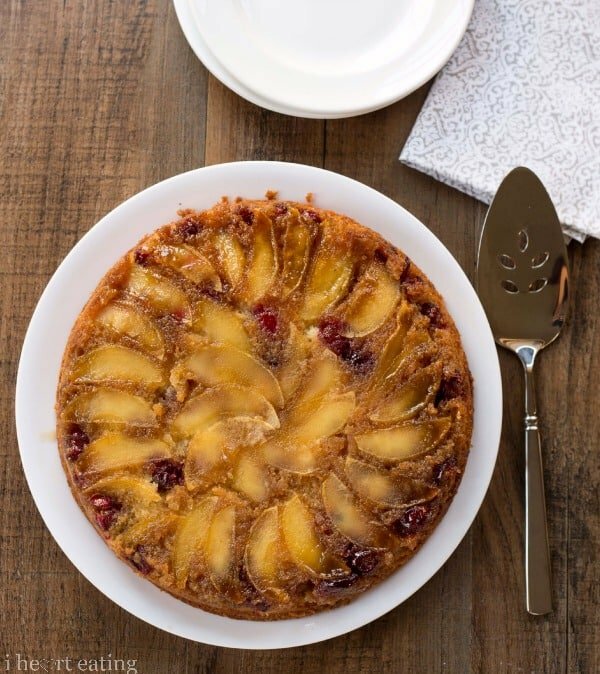 This Cranberry Apple Upside Down Cake, though, takes things to a whole ‘nother level. 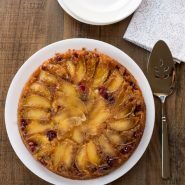 The cake is buttery and tender, and the topping is a delicious blend of tart and sweet, sugary fruit. It is, without a doubt, the best upside-down cake that I’ve ever had. 1 c. thin apple slices peeled - I use Granny Smith. Put butter in pan, and place it in the oven while the oven preheats. Leave it in there until it melts (keep an eye on it, though). Arrange apple slices over the brown sugar, and then sprinkle cranberries over apple slices. Set aside. Add the vanilla and milk; mix well. This a delicious cake! I made it today for brunch, and it received rave reviews from my family. Thank you! Thanks for sharing this at our Marvelous Monday party. I love cranberries and this looks fantastic! Pinning! Oh my goodness Kate! This cake looks amazing! Pinned!